The Energy East pipeline is a climate nightmare. A Halloween campaign from 350.org is protesting the pipeline project. As they explain, "climate change is scary -- and so is the largest tar sands pipeline ever proposed. What's even scarier is that this monster of a tar sands pipeline, TransCanada's Energy East project, wont receive a climate review." If it is allowed to go forward, it will have a climate impact equivalent to over 7 million cars. That is why 350.org is shining a light on the Energy East climate nightmare this Halloween. 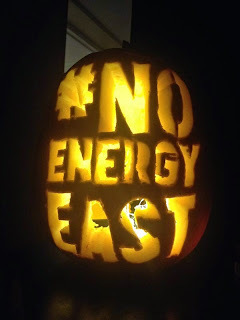 This Halloween, 350.org is encouraging people to carve "#NoEnergyEast Jack-O-Lanterns." They suggest that people deliver these pumpkins to their local elected offical's office or home. They also suggest that people take pictures and post them on their social media portals and send them to news outlets. The goal is to build a national narrative showing that the Energy East pipeline is a climate nightmare. Click here to sign up to lead an action! After signing up you will have access to printable Jack-O-Lantern templates and a full action kit.